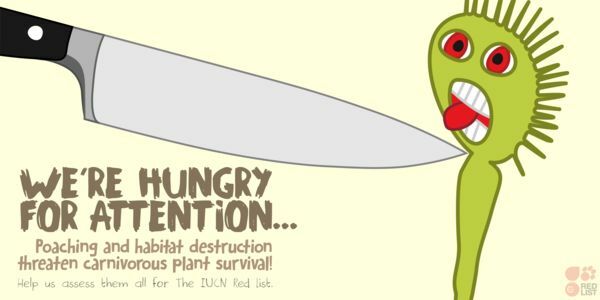 texte de la pétition: HELP carnivorous plants before they become extinct! HELP carnivorous plants before they become extinct! Support the IUCN red list carnivorous plant campaign until it is 100% funded! In the 19th century, some scientists discovered that not every animal found inside pitchers was dead. In fact, some animals seemed to be thriving inside the soupy liquid contained in the bottoms of the traps. We now know that hundreds of specialized species of insects spend at least some part of their life cycle inside pitchers, and that most of these species cannot survive anywhere else. The majority of them feed upon the dead animals trapped by the pitchers, but some are predators, feeding upon other pitcher inhabitants. Many of these pitcher specialists are larvae of mosquitoes and midges, but there are also flies, mites, spiders, crabs, moths and frogs. Without pitcher plants, none of these remarkable animals would exist. Unfortunately, many people find it hard to get enthusiastic about mosquitoes, flies and spiders, so the intrinsic beauty and complexity of the associations between these animals and pitchers might be difficult to appreciate. Fortunately, in recent years, we have found that a particularly cute species of mammal also depends on several species of pitcher plants for food, as does a remarkable little bat. In the highlands of northern Borneo, the Mountain Treeshrew (Tupaia montana) feeds on sugary secretions produced by pitchers of three of the largest of all pitcher plant species (Nepenthes rajah, Nepenthes lowii and Nepenthes macrophylla). Treeshrews are about the size of a small squirrel (or large rat), and their body size is a perfect match for the dimensions of these pitchers. Treeshrews mark the locations of valuable food sources with scats (i.e., poo), and as the pitchers qualify as valuable sources of food, a lot of poo gets deposited in them. That’s right… in them, not on them! When the tree shrews eat nectar from the pitcher lids, their bottoms are positioned over the mouths of the pitchers and the poo drops in, replacing animals as the plants’ primary source of nutrients. A similar association operates in the lowlands of Borneo, where another pitcher plant, Nepenthes hemsleyana, hosts a species of bat, Hardwicke's Woolly Bat Kerivoula hardwickii. The bats roost in the pitchers, pooing in them as they do so and providing the plant with valuable nutrients. In return, the plant provides the bats with a safe roost site that also helps keep numbers of external parasites under control due to its unique surface properties. Known only from a single location in North Sumatra Province, Indonesia, this spectacular carnivorous pitcher plant may be the closest to extinction in the wild at present of all the Nepenthes species. Only 24 specimens of this extremely rare plant species were ever discovered in the wild, all outside of national parks and nature reserves. Unfortunately, that small number has been decimated by poaching and habitat destruction, and a recent survey confirmed just two individuals surviving in the wild today. The traps of this plant are home to a wide range of dependant animals, including mosquito larvae and other arthropods. These incredible natural history stories have only emerged since 2009, and all of them involve plants that scientists have been familiar with for more than 100 years. Who knows what other amazing animal-carnivorous plant associations await discovery, or how many other animals depend on carnivorous plants for a living? It will probably take several more decades of research before these questions can be answered, but we may not have that much time. Many species of carnivorous plants around the world are at risk of extinction due to the activities of people. The problem is, in many cases, we do not yet know which species are threatened and which ones are not. With limited resources, we can only study small numbers of species at any given time, but with more than 750 recognised carnivorous plant species worldwide, the task of assessing the conservation status of all of them is huge. However, there is one thing we can do to accelerate this process: there are a number of specialists around the world who have extensive knowledge of a wide range of different carnivorous plant species. If we can bring them all together in one place, for several days in 2016, we can gather enough data to make genuine progress towards our goal. If we can do this, then we will be in a much better position to determine which species are most in need to help. Carefully designed, targeted conservation initiatives can help all species of carnivorous plants to survive, because funding can be efficiently directed towards the species and habitats that need it most. Indirectly, this will also help a large number of dependent animal species to survive – giving us a “two for the price of one” outcome and helping us do the best we can for the widest possible range of species. Helping to save animals from extinction by donating towards the conservation of plants might seem like a strange way of contributing, but as I said at the start of this blog, everything to do with carnivorous plants is strange, and any support you can give us would be deeply appreciated. Here's a Wikipedia article outlining the conservation status of many species of pitcher plants. Here's a really, really great story to read about just how threatened some of these plants are in the wild. So this petition is to raise awareness for IUCN and their latest campaign, which so far is sitting at 43% funded on the last day. This money is to help assess all carnivorous plants which face increasing habitat destruction around the world. Other animals [including cute & furry little bats] need those plants to survive, and we don't want to lose 'key' species in an ecosystem. When I started this campaign, only $10,881 had been given. While that is a nice enough figure and certainly better than nothing, I think the international community can do much better than that. I would like to see it at least 100% funded! I think this is a fantastic campaign and it deserves SO much more attention. The campaign shouldn't end just because it is the 31st of December. It should continue until it is 100% successfully funded. 80% of the world's ~750 carnivorous plant species have not yet been assessed for The IUCN Red List. We need this information to guide critical conservation action. Countless organisms, from bacteria to swimming ants to woolly bats, depend on carnivorous plants for food and shelter. For example, woolly bats roost in Nepenthes pitcher plants to keep their wings moist and free of parasites. In exchange, the plant gets nutritious bat poo! You know, I wasn't even aware of the IUCN's existence until earlier this year. So by signing this petition, you raise the chance of people donating more money to them. "we have been working closely with carnivorous plant societies and nurseries around the world to spread the word about the campaign. While our end-of-year goal for 2015 was to reach USD 25,000 in donations, our long-term aim is to raise an additional USD 100,000 over the course of 2016 to enable the assessment of all remaining carnivorous plant species." PLEASE DON'T STOP GIVING! Raising this amount will enable us to bring together the world’s leading carnivorous plant experts for a 5-day assessment workshop at Kew Gardens, London in 2016. The outcome will be that many species will be classified for the first time and their conservation status known. Attendees will also develop a plan for assessing all remaining species, some of which require field trips to remote locations. SUCCESS!! Thank you everyone for signing, sharing & donating. 20 sigs in 24 hours! I would like to ask you one more favour, and that is if you could share this petition on youtube, facebook, G+ and twitter. I realise it can be a bit embarrassing to share something like this, but I've not been ridiculed. At most your friends would ignore it and carry on as normal. They may think you're a bit weird, but they probably already think that anyway. I know you are great people. Thanks to you all for caring & sharing!